Message: System.ApplicationException: Unable to load page from assembly 'ColumnPermissionsPage.dll'. ---> System.IO.FileLoadException: Could not load file or assembly 'ColumnPermissionsPage, Version=4.1.0.71, Culture=neutral, PublicKeyToken=57e4eee64106844e' or one of its dependencies. Operation is not supported. (Exception from HRESULT: 0x80131515) ---> System.NotSupportedException: An attempt was made to load an assembly from a network location which would have caused the assembly to be sandboxed in previous versions of the .NET Framework. This release of the .NET Framework does not enable CAS policy by default, so this load may be dangerous. If this load is not intended to sandbox the assembly, please enable the loadFromRemoteSources switch. See http://go.microsoft.com/fwlink/?LinkId=155569 for more information. When you download file (e.g. https://download.eway-crm.com/admin/AdministrationApp-5.0.0.125.zip), some version of Microsoft Windows can mark it as a file from another computer. You need to unblock it in the file properties - mark Unblock field and confirm your choice. 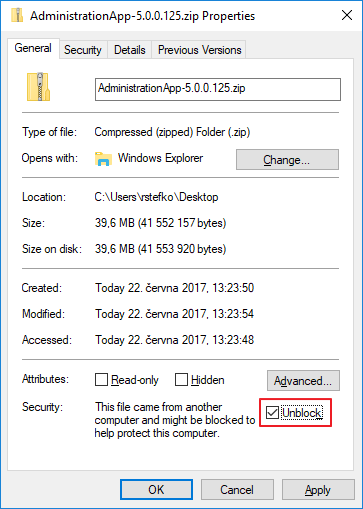 If the file is correctly unblocked, "This file came from another computer and might be blocked to help protect this computer" text will disappear.